Today Prime Minister Stephen Harper appeared at a school about 5 doors away from my house. We found this out on Easter Sunday when the school sent out a phone call to parents telling them, who then told us that he'd appear on Tuesday morning at the school. We all immediately jumped at the opportunity to protest. Most people at the Enbridge and Kinder-Morgan pipeline expansions. Myself at Bill C51. As Tuesday morning came around, I had a few meetings to polish off which meant I missed the start. 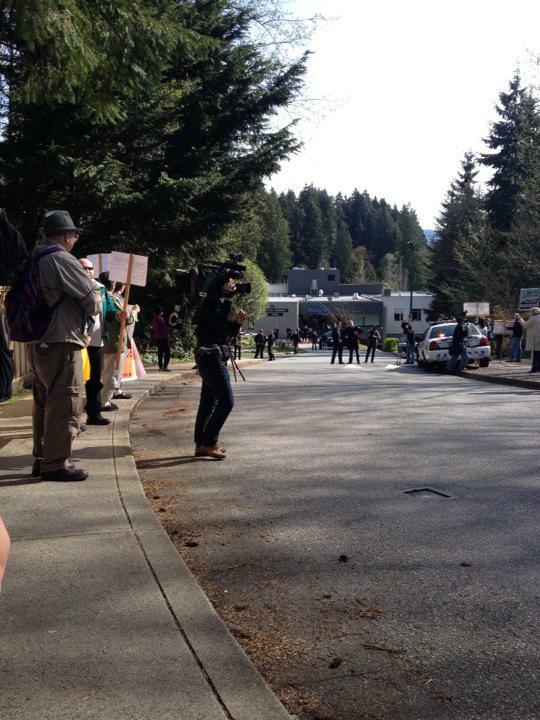 Apparently upon seeing protestors, Stephen Harper went around the back and came in through a back path to avoid them. I came along later to find I wasn't the only one there. The protestors had split up between the main entrance and the back entrance. Most of the protestors were there about oil, I was about that Bill C51. I felt pretty good turning up in my Mozilla t-shirt knowing that Mozilla cares about this sort of thing. I was encouraged to find a bunch of people protesting Bill C51, which made me feel good about not bringing a sign since I could stand near them. I found it a little uncomfortable because there was one chap with a loud speaker who was being a bit vocal about his opinions which I didn't all agree with. I'm very bad at following crowds in chants. This was a pretty big deal for Deep Cove, with RCMP plains clothes officers lurking in bushes and lots of other police around in flak jackets. It seemed Harper spoke in front of a bunch of bored students and people in hard hats. Those people in hard hats got bussed in and out, they had nothing to do with the school. They just seemed to be excited to be on television with Harper. Meanwhile in Canada, the Canadian Parliament is considering an even more concerning bill, C-51, the Anti-Terrorism Act of 2015. C-51 is sweeping in scope, including granting Canadian intelligence agencies CSIS and CSE new authority for offensive online attacks, as well as allowing these agencies to obtain significant amounts of information held by the Canadian government. The open-ended internal information-sharing exceptions contained in the bill erode the relationship between individuals and their government by removing the compartmentalization that allows Canadians to provide the government some of their most private information (for census, tax compliance, health services, and a range of other purposes) and trust that that information will be used for only its original purposes. This compartmentalization, currently a requirement of the Privacy Act, will not exist after Bill C-51 comes into force. The Bill further empowers CSIS to take unspecified and open-ended “measures,” which may include the overt takedown of websites, attacks on Internet infrastructure, introduction of malware, and more all without any judicial oversight. These kinds of attacks on the integrity and availability of the Web make us all less secure. After a while it became clear he'd gone in one of the unmarked blacked out cars and that was that. People wandered off, I got back to work after spending just 30 mins on the protest. In the end it was mentioned on the news the protestors turned up, so that felt cool. Although a lot of talk is about how Stephen Harper is at the other end of the country from the Mike Duffy trial. Very convenient. Amsuingly I realised that to sneak into the school Stephen Harper had to walk down a path that I walk regularly with my dog. I always clean up my dogs poo, but I know other people don't on that path. Perhaps he stood in some.